Where did you get those windows? Can you tell me a ball park cost of the window. Can't seem to find out online. Than you - This window is such a great feature. I would love to incorporate it in my own kitchen remodel. 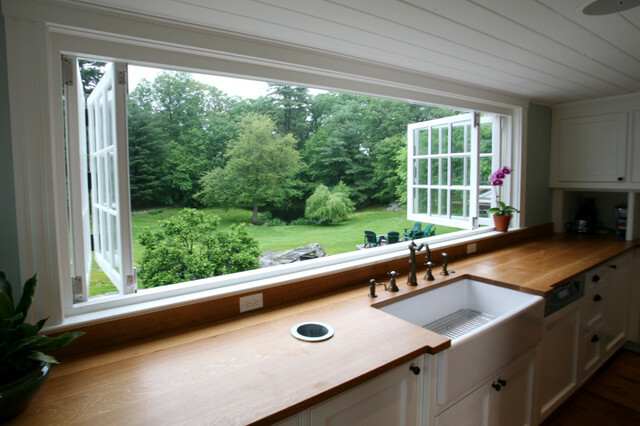 Have you experienced any problems with the apron sink mounted in the wood counter? - I would like to use the same construction but my contractor says it's too difficult to protect the wood from water damage. use a two part epoxy sealer on the end grain. Potential for window to the back yard?